When someone is nice to us, we likes to keep them around. We likes them, don't we, precious? But then there are people who are not nice to Smeagol. Should we be quiet? Should we let it go? 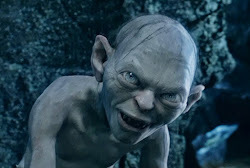 Should we let them hurt poor Smeagol? No, no precious! We doesn't have to stay with people who aren't nice to us! We already posted ideas for getting rid of friends. But we must also get rid of enemies, don't we precious? We think long and hard about this, but we comes up with a solution. Then Smeagol leaves nasty hobbitses and repays them for what they've done, yes? And we gets a meal at the same time. Or if hobbit isn't it's favorite meal, it can give the hobbitses to a friend. She could do it, if precious doesn't want it. It shouldn't stay in friendships where they hurt it! It can just eat it! We got a question asking for advice! I need new conditioner, what type would you recommend? You've been able to keep your hair in very good condition, even when traveling with the hobbits. It thinks our hair looks nice? That make Smeagol happy! But we doesn't do anything with it. We keeps it natural. We thinks that is the best way to take care of it. Don't add slimy things to it. Let your hair go freeee! Ah, I see, free hair is healthy hair! No one hurts one of our followers! Gollum, gollum. Send them to us, we will eat them for you, precious. Yes it is free! It is healthy!